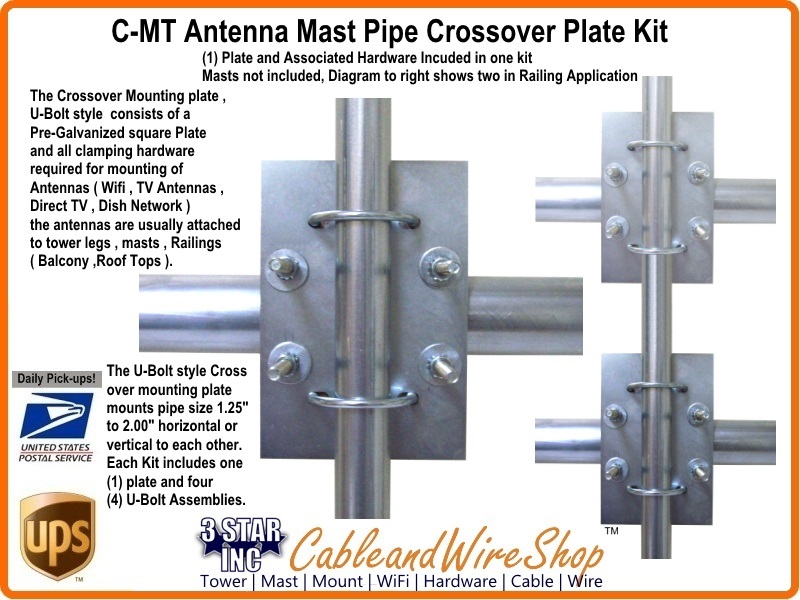 For Pipe 1.25" to 2.00"
The Crossover Mounting plate, U-Bolt style consists of a Pre-Galvanized square Plate and all clamping hardware required for mounting of Antennas (Wifi, TV Antennas, Direct TV, Dish Network) the antennas are usually attached to tower legs, masts, Railings ( Balcony,Roof Tops ). The U-Bolt style Crossover mounting plate mountS Pipe size 1.25" to 2.00" horizontal or vertical to each other. Each Kit includes one (1) plate and four (4) U-Bolt Assemblies. Plate Dimensions 5" x 7"